Dietitians’ Week: A snapshot of my life as a dietitian. 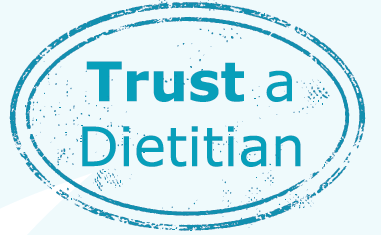 This week 8th-12th June is officially DIETITIANS WEEK. Unfortunately that doesn’t mean a week off for us hard-working dietitian’s. Maybe I should suggest that! Instead many departments and dietitians around the UK are taking the opportunity to work even harder and put on special events to celebrate and highlight dietitians. There are also twitter chats happening and receptions at places like the House of Lords! To celebrate I thought I would share a snapshot of how I work as a dietitian. I’m a freelance dietitian, so there is no big department for me, instead I work either on my own from the delights of my loft… or as part of a team of therapists and health professionals. A large amount of my work is supporting clients with eating disorders, either face to face or via Skype. I also enjoy getting involved with media work and project work. I love the variety my work brings me. I work around my 2 small children, which means I can tend to work odd hours. Plus I also run a Pilates business with my husband. That’s currently 24 classes run from our studio. Life can get a bit hectic! 1. Eating Disorder Clients. I tend to have 6-8 clients a week. These are via Skype or I see people at Wings Counselling where I work as part of a team of therapists and a psychiatrist. These clients can take up quite a lot of me time as once I have chatted to them there can be meal plans to adjust, phone calls to liase with the GP and often I am in daily email contact with the client. 2. Chronic Fatigue Clients. This is a smaller part of my role and I have 1-2 clients on my books at present. Again here I work as part of a team that includes a physio, several Occupational Therapists and some nurses. This involves home visits and phone calls. I also advise the team on the rest of the client base. 3. Other issues. I also see a few clients each month for other conditions such as IBS, weaning and food intolerances. I have to be careful how much I take on so am quite specific about the areas I work in. 4. Media calls. These can vary but I usually do at least 2 a week. Sometimes I find I am doing these daily and then other weeks I only do a couple a week. I give quotes for the press, for websites and for magazines, chat to television producers, go on the radio and sometimes appear on the screen too. 6. Social Media. Now I’m no social media expert, it is something I’ve fallen into, but also something I’m now addicted to. I see the benefits to myself, to the profession and I enjoy it most of the time. Blogging, networking, tweeting, making videos, posting pictures and coming up with new ways to get messages across. I’ve taken part in Google Hangouts on nutrition and in live twitter chats. My latest venture is playing with Periscope. Go check it out. So no hospitals and white coats for me. Being a dietitian is diverse. The world is your oyster. Go grab it. 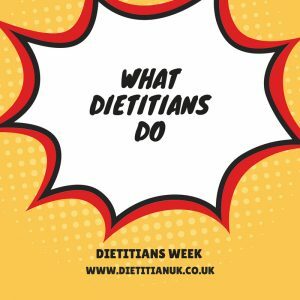 This week is excitingly the very first Dietitians week. 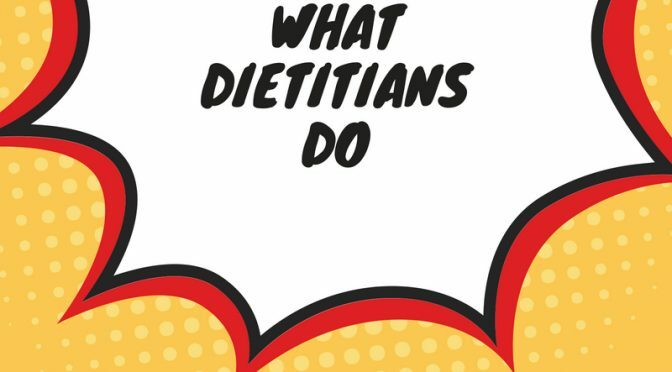 Departments and dietitians all around the country and some internationally will be putting on events, stands, talks, blog posts and generally shouting about dietitians, nutrition and food! Being a small freelancer I’m not putting on an event but will be sharing some blog posts and taking part in the twitter chats that are happening. 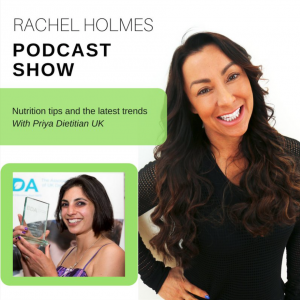 I love chatting to others about nutrition and find these twitter chats fantastic for sharing knowledge, asking questions, sharing information with other dietitians, staying up to date with the research and getting top tips on resources and recipes. So if you can… pop on by, just search for the hastag #RDUK on twitter (or I use tweetchat). You can join in the chat or just read the tweets. Follow: @RDUK and @dietitiansweek as well as me @dietitianuk.